This book shows the reader the techniques of Nigerian and African cooking. Caroline Bimbo Afolalu is the founder and director of Beautiful Foods Ltd, a food manufacturing company that has being producing the leading African snacks for retailers and major supermarkets in England since 2001. She has a unique experience of translating simple food ingredients into tasty African food. She shares her recipes and skills acquired both as a child cooking with her mother and whilst running Beautiful Foods Ltd. This has empowered her to write an invaluable cookbook. This book is about teaching and passing on skills and practical experiences gained in her cooking career to the next generation and ensuring the taste of African food become widely acceptable to the world. The book is about you and your hospitality both at home and at parties. 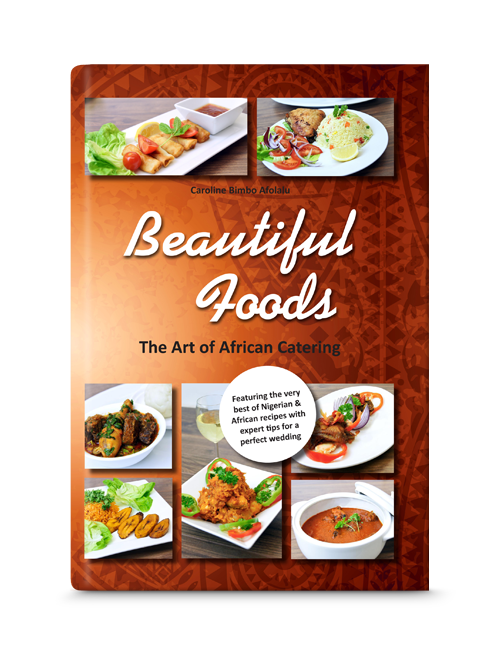 The book contains over 100 recipes, both traditional Nigerian and modern, plus expert tips on planning successful weddings and events. All aspects of cooking are covered, including roasting, boiling, baking and food processing. The book will be a valuable collection for professional caterers, catering students, wedding and event planners and young people.